When your family thinks that every meat needs a potato side dish, you kind of become a pro at them. 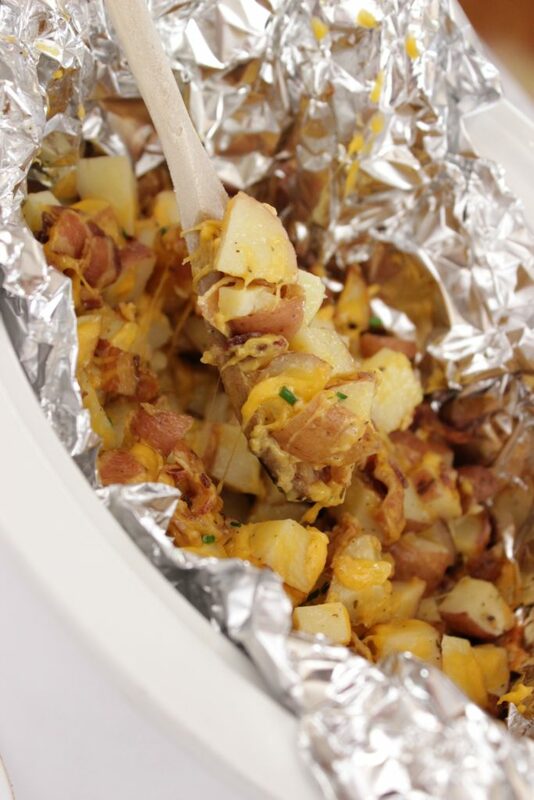 And this Cheesy Ranch Potatoes side dish is one of our favorites for sure! We just love potato side dishes! 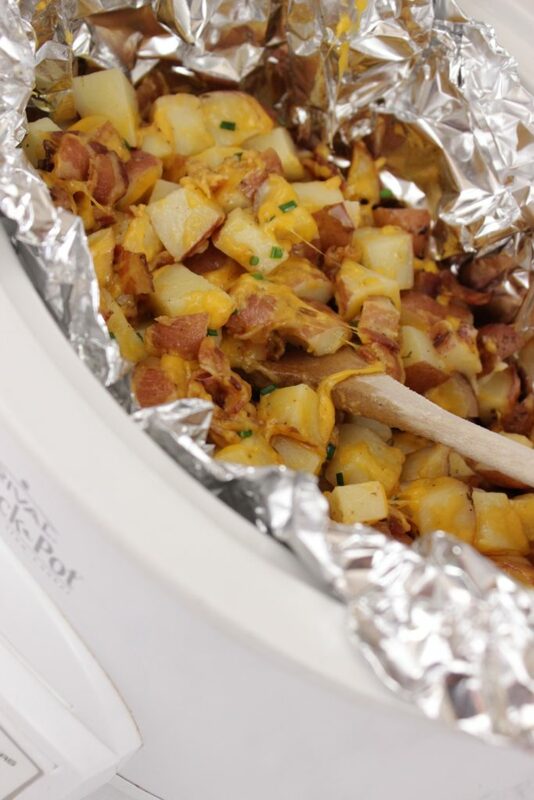 My Cheesy Potatoes Crock Pot Recipe and my Cheesy Potatoes Potato Bake Side Dish recipe are oh, so wildly popular that I just knew that I had to share this potato side dish — it’s one of my personal favorites. 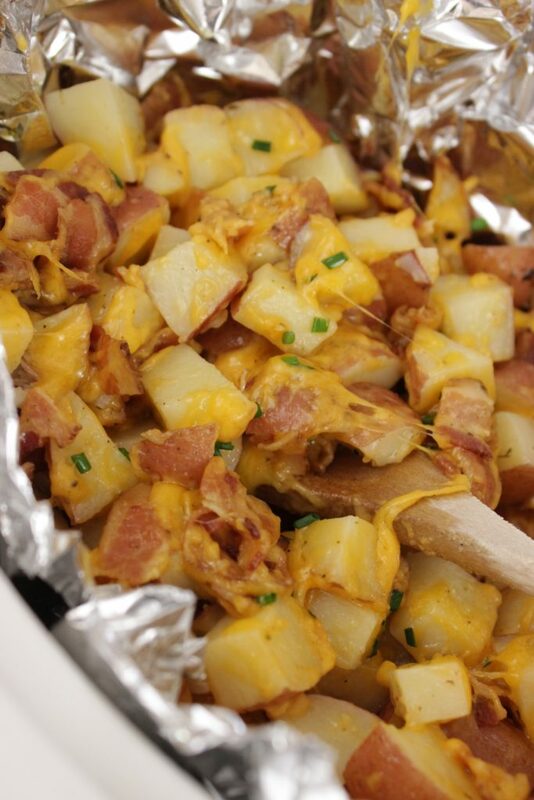 But, when you mix potatoes, bacon, cheese, and ranch … how can something of that caliber not be a favorite?! So, as I am writing (typing, ) out this recipe it’s summer, and Iowa has had a huge heat wave. To where the temperatures feel like 105 to 110 degrees. And that is HOT if you ask me! So, making crock pot side dishes are the way to go, so I can leave the oven off and the heat of the grill (for the meat) outside, too. 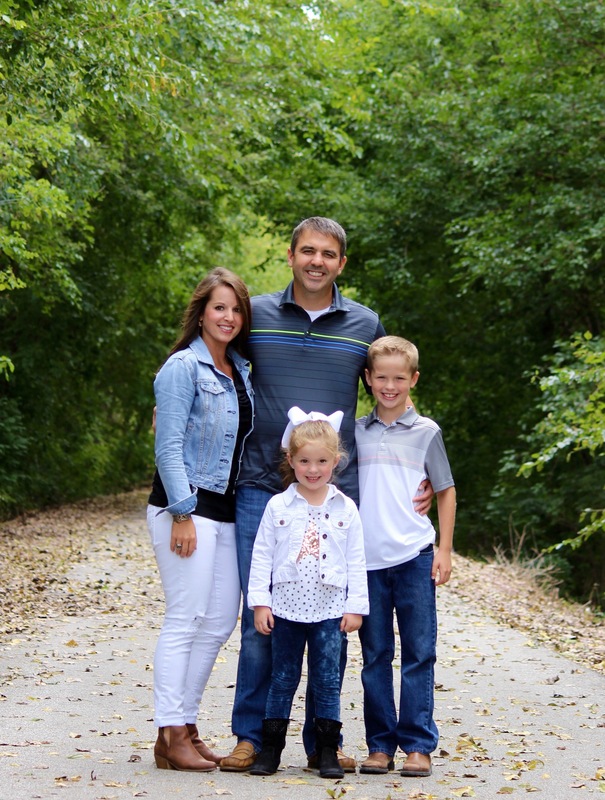 That helps save money … and my sanity. 😀 Killing two birds with one stone. 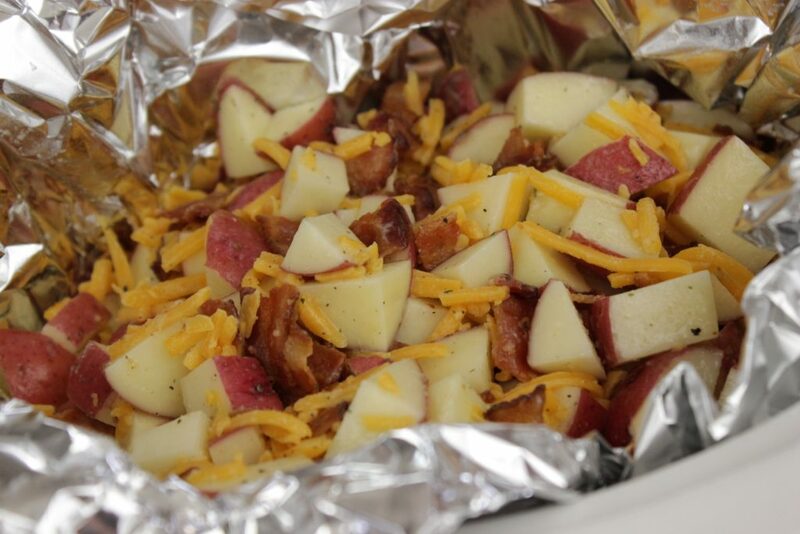 As much as I love my crock pot side dish recipes, we are big fans of red potatoes. My husband makes a side dish that we often cook on the grill with bacon, carrots, seasoned salt, onions, red potatoes and all that jazz (which is awesome, don’t get me wrong!) but it takes quite some time to cook on the grill. SO, this potato crock pot side dish is easy peasy since it’s literally mix and go and the crock pot does all of the work. If you don’t cook your bacon in the oven yet, I just can’t recommend it highly enough. The bacon is crispier, you have less mess and can cook a lot at one time. You can cook as much as you’d like, pending the baking sheet is big enough — I use this one so that I can cram as much on there as possible and it’s my absolute favorite! And, a baking sheet rack is also a nice addition to get the bacon up out of the grease. Personal preference, but you can’t go wrong with one! Cooking the bacon is hands down the hardest part of this recipe — I can promise you that! Next, cut your red potatoes in cubes. Hold the potato vertically, slice it down the middle, turn it and slice it vertically again. Then, lay it horizontal and cube it into thirds or fourths depending on how big the potato is. You’ll want about three pounds total, which like I had said is about 10-12 red potatoes. Remove one tablespoon worth of Hidden Valley Ranch seasoning from a packet and set aside. Melt two tablespoons of butter and set aside and grab your black pepper. You’ll need about 1/2 tsp depending on taste. In a large bowl, add your cubed potatoes, mix in your melted butter, pepper, ranch seasoning (you can make your own homemade ranch seasoning, but for me personally, I love Hidden Valley’s) and stir well. Lastly, add in your cooked and crumbled bacon, and your cheese. 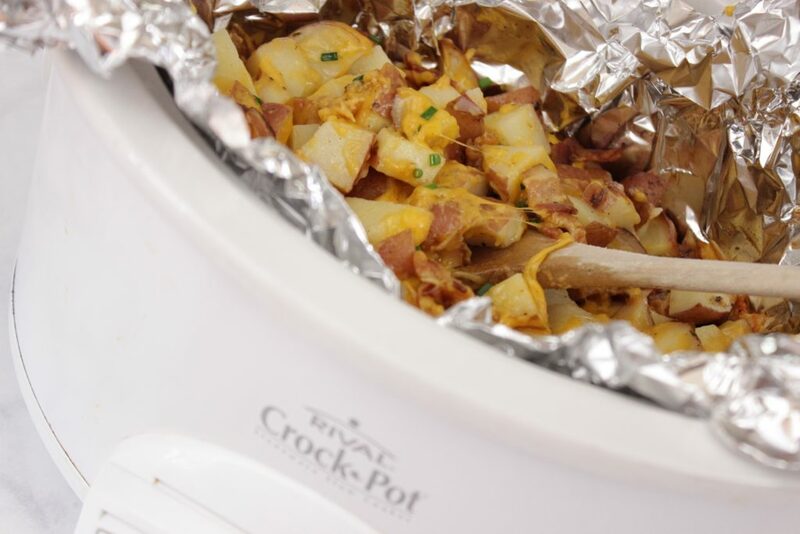 Set out your crockpot and use a large piece of heavy duty foil to line the crockpot with. It’s going to serve as a foil packet for the potatoes to cook and steam. YUM! Spray the foil with cooking spray and add the potato mixture to the crockpot. 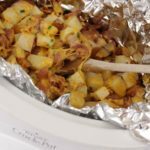 Gently fold the foil over the potatoes, put the lid on top of the crockpot and cook on high for 3-4 hours or low for 7-8 hours. When the potatoes are done cooking, sprinkle with cheese and chives if you wish. Delicious, I tell you – simply delicious! These are perfect if you’re looking for side dishes for ham or simply easy potato side dishes! These Cheesy Ranch Potatoes are oh, so easy and simply AMAZING! Pair with any meat off the grill - or use this as a side dish for ham. Either way, you just can't go wrong! Cut your red potatoes in cubes. Hold the potato vertically, slice it down the middle, turn it and slice it vertically again. Then, lay it horizontal and cube it into thirds or fourths depending on how big the potato is. Remove one tablespoon worth of Hidden Valley Ranch seasoning from a packet and set aside. Melt two tablespoons of butter and set aside and grab your black pepper. You'll need about 1/2-1 tsp depending on taste. In a large bowl, add your cubed potatoes, mix in your melted butter, pepper, ranch seasoning and stir well. Lastly, add in your cooked and crumbled bacon, and 1.5 cups of cheese. 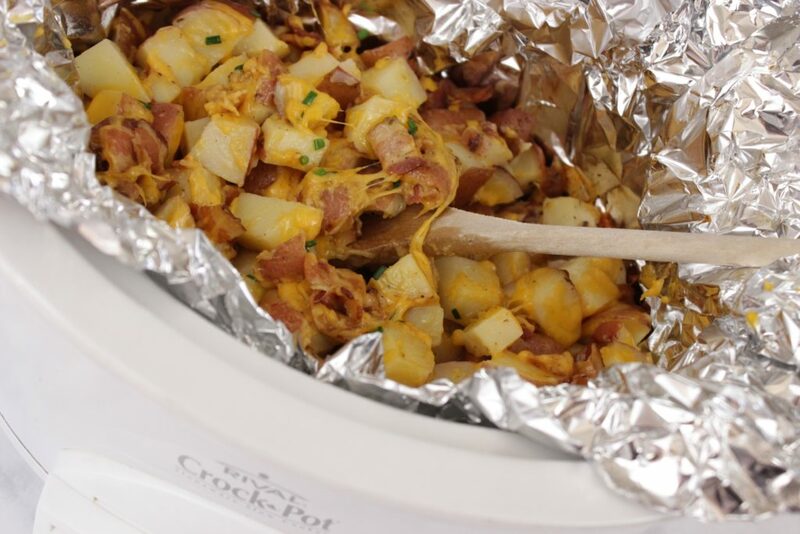 Set out your crockpot and use a large piece of heavy duty foil to line the crockpot with. It's going to serve as a foil packet for the potatoes to cook and steam. YUM! When the potatoes are done cooking, sprinkle with cheese, cover for 5-10 minutes. Lastly, add chives if you wish. Can you make this without the ranch seasoning? Or substitute for ranch seasoning?